The main difference between creativity and intelligence is that the creativity is the ability to create new ideas and concepts and also to enact or to produce them while intelligence is the ability to acquire knowledge and to utilize it. Creativity is a part of one’s intelligence. Therefore, both these aspects of one’s intellect are closely linked together. Basically, creativity means the ability to create new things that do not exist. It is thus, entwined with aspects of imagination and inventiveness. In simple terms, creativity is the ability to come up with new ideas and concepts in relation to already existing ones. 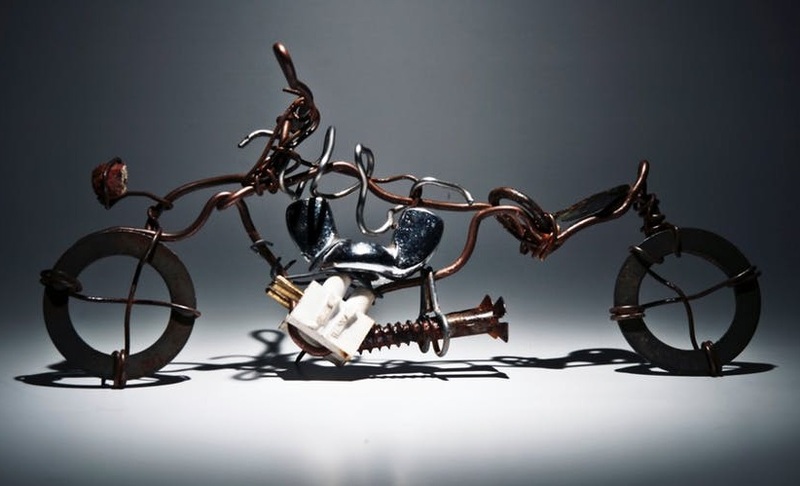 The Oxford dictionary defines this adjective creativity as ‘the use of imagination or original ideas to create something; inventiveness.’ Therefore, being creative is not a talent that everyone possesses. The one who is creative in his thinking can be considered a unique and a rare person out of the ordinary lot. Similarly, creativity is the ability to perceive the world and things in it in a novel manner, to explore the undiscovered and to generate solutions out of it. In other words, creativity is an amalgamation of the two processes namely, thinking in a novel way and then enacting or producing it. In a way, creativity goes beyond the intelligence framework and connect the already existing concepts with new ideas. For example, think of a science-fiction or an innovative creator of robotics technology. That person has to break the existing boundaries of concepts and create connections between the novel and imaginative things with the real things. And the final product out of it will be a novel thing that the ordinary man has never imagined to be. This is what creativity means. Therefore, creativity in simple terms means, being innovative. 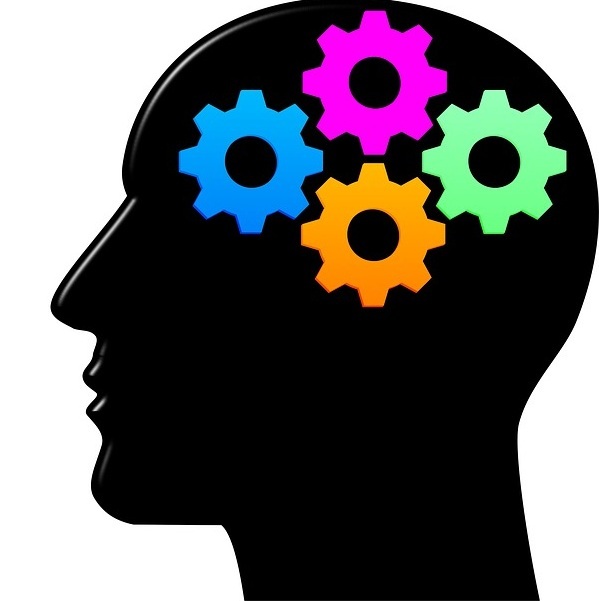 Oxford dictionary defines the term intelligence as ‘the ability to acquire and apply knowledge and skills.’ Therefore, intelligence not only means to learn everything without using that knowledge accordingly instead it is the usage of that acquired knowledge effectively and efficiently to solve the problems. Albert Einstein once remarked that “The true sign of intelligence is not knowledge but imagination” highlighting the fact that creative thinking is a fundamental part of being intelligent. Moreover, from a psychological perspective, human intelligence can be defined as the ‘mental quality that consists of the abilities to learn from experience, adapt to new situations, understand and handle abstract concepts, and use knowledge to manipulate one’s environment.’ Basically, the fundamental fact that distinguishes the human species from all the other animal species is the advanced intelligence that only humans possess. Creativity is the ability to perceive things in a novel manner, create new ideas and concepts, and thus, to make innovative creations while intelligence is the ability to acquire knowledge and to utilize it accordingly. Therefore, creativity requires different thinking. 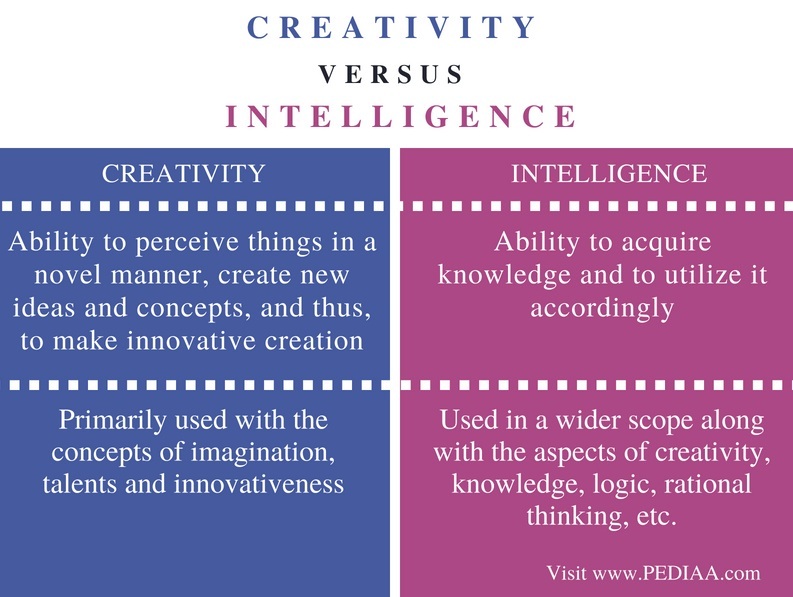 Creativity is primarily used with the concepts of imagination, talents and innovativeness while intelligence is used in a wider scope along with the aspects of creativity, knowledge, logic, rational thinking, etc. Creativity and intelligence are intellectual abilities of a person. Creativity or creative thinking is a part of one’s intelligence. Nevertheless, if one is to draw a fine line of separation to identify the difference between creativity and intelligence, the main difference that can be outlined is that creativity is the ability to perceive something in a novel manner and thus create something new out of it while intelligence is the ability to acquire knowledge and utilise it accordingly. 1. Sternberg, Robert J. “Human Intelligence.” Encyclopædia Britannica, Encyclopædia Britannica, Inc., 26 Apr. 2017, Available here. 2.“Intelligence.” Wikipedia, Wikimedia Foundation, 29 June 2018, Available here. 3. “Creativity.” Wikipedia, Wikimedia Foundation, 27 June 2018, Available here.